(Bloomberg) -- The world’s rubber traders aren’t getting carried away by the commodity’s 16 percent rally this year. Prices are still more than 70 percent off its peak in 2011 and key players are forecasting at least another bad year, with the most bearish predicting lower prices to last another decade. Blame is being placed on overproduction, with criticism lobbed at the growers’ mismanagement in balancing supply with demand. These views may not come as a shock to those following the rubber market closely. Trees that were planted in top growers Thailand, Indonesia and Vietnam during the 2011 price boom have been maturing, pushing global production up to repeatedly hit new records. While futures have gained this year, helped by news Asia’s major producers will curb exports, the rally has started to stall on concerns over how effective the cut will be. 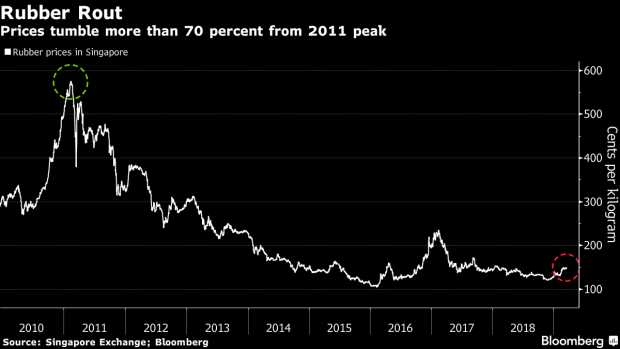 “The only way you can sustainably support prices is by leaving the rubber in the trees,” said Michael Coleman, a veteran rubber trader and the director of RCMA Group, which has an approximately $1.3 billion a year soft-commodities turnover. Curbing exports by producers is a very short-term solution and its effectiveness is unclear, he said. Coleman’s gloomy outlook is joined by industry associations including U.K.-based Tire Industry Research. Global rubber output is likely to continue outpacing tire demand until around 2027-28 and producing countries will be stuck for almost a decade in a period of very low prices, according to the chief executive at Tire Industry Research David Shaw, who’s been watching the rubber market for 30 years. As low prices discourage planting, the price may spike on a shortage in about a decade, he said. If producers “were to look at projected demand in ten years time and arrange planting in order to roughly balance demand, they could ensure much more stable pricing,” Shaw said. Governments should have been controlling planting more carefully to balance supply and demand into the future, he added. It takes about seven years for trees to reach production once a plantation is started and then produce for a further 20 to 25 years. Given the huge investments in enlarging plantations during the price boom, farmers have to keep producing even at current low prices because they lack alternative sources of income, contributing to the glut, according to Salvatore Pinizzotto, Secretary-General of International Rubber Study Group. Thailand, Indonesia and Malaysia, which supply about 70 percent of the global output, will cut exports by a combined 240,000 tons over four months starting on respective dates from April. While Thailand, the biggest producer, agreed to cut exports, it may have a harder time cutting production. With elections due on March 24, political parties have been seeking to win farmers’ votes with guaranteed crop prices, inexpensive loans and cheap health care, aiding an expansion in rubber output. Farmers make up more than half the country’s electorate. For RCMA’s Coleman, demand isn’t particularly weak, and oversupply is the problem. The lower prices is the market’s way of dispelling higher cost producers, he says.